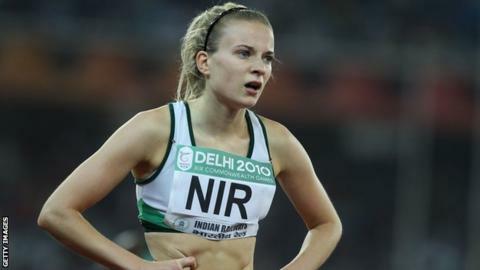 Northern Ireland athlete Joanna Mills has won her appeal against her omission from the Ireland 4x400m relay squad for the Olympics in London but may face a counter appeal. The panel hearing Mills' appeal met on Saturday morning and upheld her plea. However there is now the possiblity of a counter appeal from Catriona Cuddihy, who has been replaced by Mills in the six-strong Irish squad. Mills competes for Ireland in next week's World Junior Championships. Athletics Ireland president Ciaran O'Cathain confirmed on Saturday afternoon that Mills had replaced Cuddihy in the Irish squad following the appeals panel decision. "Catriona can now appeal the decision to the Olympic Council of Ireland and Athletics Ireland will make no further comment on this decision," said the Athletics Ireland official. Mills was named in the Irish squad for the European Championships but Jessie Barr's inclusion led to the Northerner being left out of the six-woman Olympic squad announced on Tuesday. The Northern Ireland athlete spoke of her "disillusionment" after that decision and said it had affected her preparations for the World Juniors. Barr was included after impressively reaching the 400 metres hurdles final at the Europeans in Helsinki. However, Mills' supporters argued that the Northern Ireland athlete should have been included ahead of Cuddihy who had been named in the Irish squad also with her sister Joanne plus Michelle Carey, Claire Bergin, Marian Heffernan and Barr. If a 19-year-old doesn't fall into the "potential to improve" criteria then who does? Catriona Cuddihy's personal best of 54.59 set on 10 June at Bedford is slower than Mills' seasonal best of 54.41. Mills was fourth in the individual 400m final at last year's European Junior Championships and has a personal best of 53.89 set at that event in Estonia. Her coach Ian Neely said that that an email explanation sent to the athlete concerning the decision simply did not stack up. The email referred to Mills' "lack of international relay and individual experience" which Neely insisted was totally incorrect. Neely pointed to Mills' placing at last year's European Juniors but also her participation in both the Irish European Youth relay team and the Northern Commonwealth Games team in 2010. "The email also referred to selecting athletes who have the potential to improve," added Neely. "Joanna is 19 while the six named women are in their mid-to-late twenties. "If a 19-year-old doesn't fall into the "potential to improve" criteria then who does?" Neely's frustration was also increased by the fact that Mills was told that she would have to travel to Helsinki for the Europeans if she wanted to remain in contention for an Olympic place - rather than being allowed to remain at home to train for the World Juniors. Mills then spent nearly a week in Helsinki taking part in relay practice but was not selected for the semi-final when the Irish quartet were disqualified.